The 23rd annual Huntsville Half Marathon was Saturday, November 12, 2011. 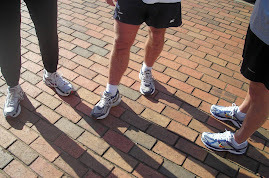 The weather was great, and there was strong participation from Limestone County runners. Also, there were 4 state age records set on Saturday. See http://www.huntsvilletrackclub.org/results/HM11/AGEREC.txt for state record details. The overall winner was Josh Whitehead of Madison in 1:10:13. The female winner was Candace Jacobs of Huntsville in 1:21:53. The masters winner was George DeWitt of Madison in a record setting 1:16:48. The female masters winner was Roberta Hauck of Madison in 1:38:03. The overall results and the age group results are at the HTC website.